While preparing for a recent trip to Las Vegas for a cybersecurity conference, I decided I would stop by Death Valley National Park before returning home. And by “stop by” I mean “climb a mountain.” I had seen a slickdeals.net post about the Garmin Fenix 3 GPS smartwatch a few days earlier, so I bought it and had it shipped to my hotel in Las Vegas. I was looking for a mountain in the eastern area of the park, close to Death Valley Junction if possible, as DVJ is pretty easy to get to from Las Vegas. It takes about an hour and a half from the car rental place at McCarran International Airport. What I found was Pyramid Peak. It’s only 11 miles from Death Valley Junction, and I found a super informative guide written by Steve Hall here. The amazing part was that Steve even included a map as shown below. This is where the fun begins. I wouldn’t receive the watch until the afternoon that I planned to leave for Death Valley, and I intended to start the hike when I arrived about 7:30 PM. I was going to haul my overnight gear, food, and water at least a mile from the road, keeping with back country camping regulations, set up camp, get a good night’s sleep, and head for the summit in the early morning. 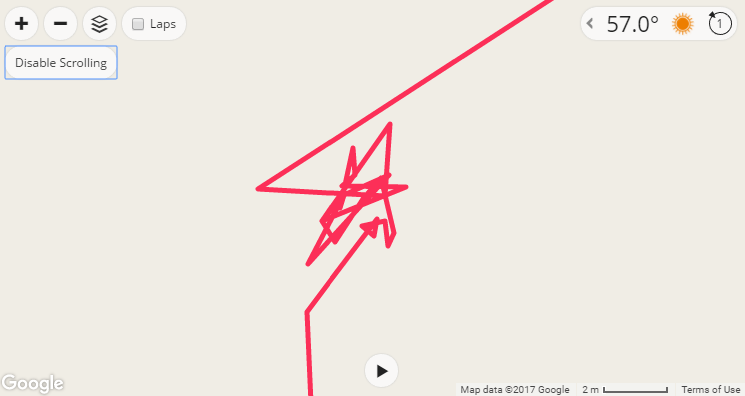 I needed to get the map shown above converted into a GPX file I could upload to my watch, and I had to get it all ready to before I even had the watch with me. So what did I do? This is where HikingGuy.com enters the picture. 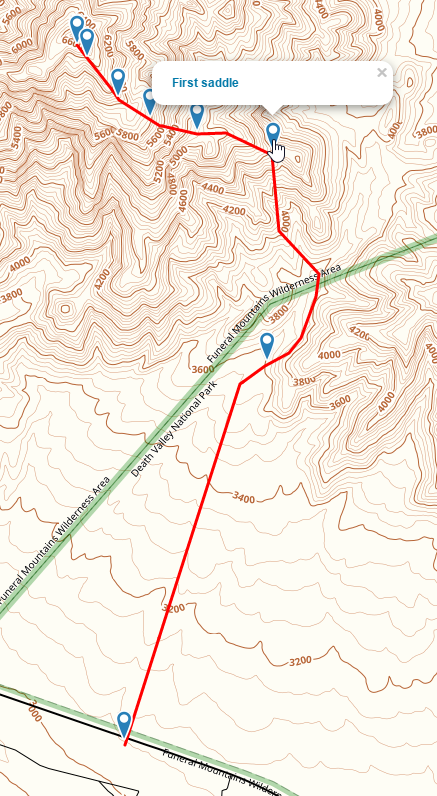 In his post titled Creating a Hike For Garmin GPS, he details how to use the map at gaiagps.com to create waypoints to create a trail and then download the resulting trail as a GPX file. Enter Photoshop. 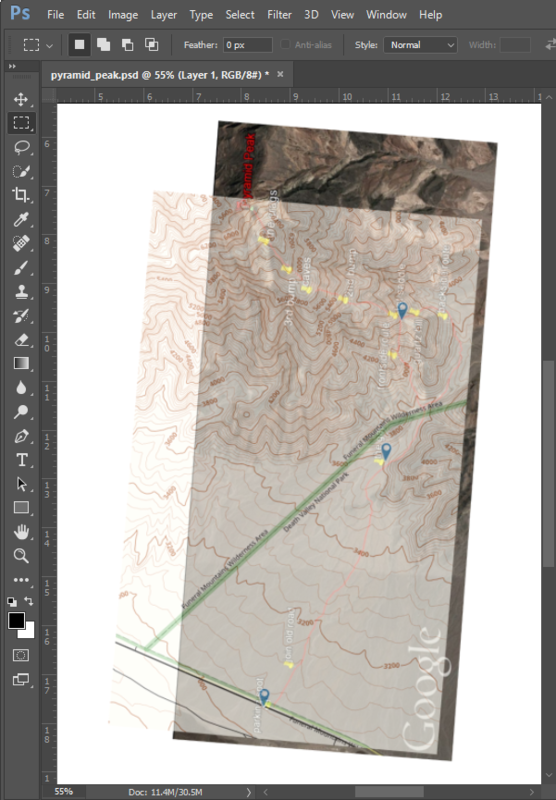 With Steve Hall’s map as a base layer, I overlayed a screenshot from the Gaia GPS map, adjusted the opacity, and resized and rotated both layers so that they were in sync. Voila! Then it was simply a matter of adding waypoints on the gaiagps.com map at the precise points where Steve placed his yellow thumbtacks. From there, it was pretty straightforward. 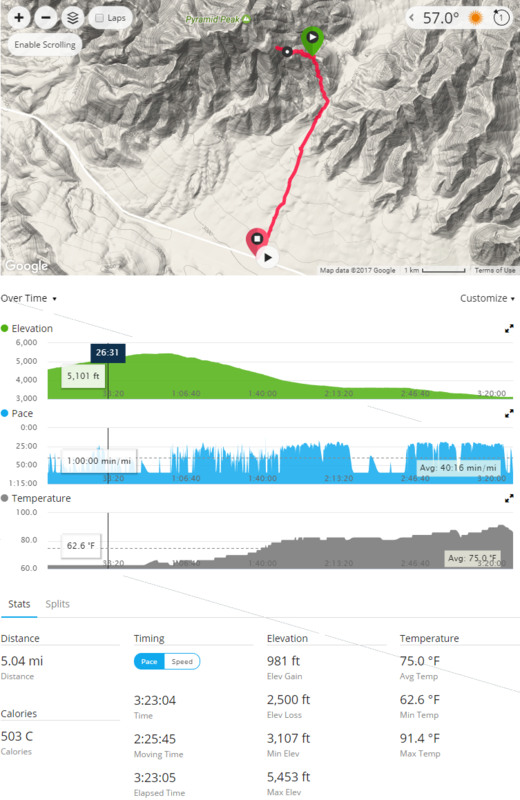 As detailed in the post by HikingGuy, I just emailed the GPX file to myself, received my watch later that week, downloaded the GPX file to the MacBook Air I had with me, loaded it into the Garmin Basecamp software, connected the watch to the MacBook, and synced the route to my watch! Uh-oh. If you’ve read this far, then you’ve seen the screenshot posted just above this paragraph. It doesn’t lie. I did not reach the summit. First, the terrain was much more difficult to traverse than I had anticipated. Second, I was and still am recovering from IT band injuries in both legs. Third, I was alone. Lastly, the best form of communication I had on me was a whistle and a mirror. I had no SOS GPS device, no satellite phone, and no cell reception on my iPhone. I wasn’t too concerned with being able to reach the summit. I was concerned about coming down and the toll that would take on my knees. So I called it. I don’t regret it though. I got some great photos and videos, and the experience was exhilirating. I would love to go back and conquer that damn summit though! I couldn’t figure out how to pause the route in order to check the time, so I kept having to restart the route on my watch. This is why the green Start icon is a few hundred feet from the furthest point I reached on the hike and the red Finish icon is back where I parked my car. Notice how much faster I get when the terrain gets flat. See the place about halfway along the red line where I seem to stand in place for several minutes? That was me fighting the fierce winds as I scrambled to pack up my tent and everything in it into my hiking backpack without anything blowing away. That “standing in place” moment is best seen up close below. Ultimately, though I did not reach the summit, I had a blast. I’d love to see more of Death Valley. I was going to stay another two nights and drive around the park, but there was one glaring flaw in my preparation plan. I had brought a sheet instead of a sleeping bag. The predicted lows were fairly high, but I did not anticipate the wind. As a result, I slept very poorly and was eager to get out of the desert. I changed my flight and slept in my own bed that night. But hey, at least I seized the day!